As some Southeast Asian countries consider using nuclear energy, the region should now be preparing a regional nuclear emergency response, incorporating technological and nuclear emergencies into its disaster management framework. AS SELECTED Southeast Asian states such as Vietnam, Malaysia and Indonesia look to utilise nuclear energy from 2020, it is imperative for ASEAN to start developing a regional nuclear emergency response and incorporating technological disaster and nuclear crisis into its disaster management and response framework. ASEAN member-states have been institutionalising national and regional disaster response mechanisms to effectively mobilise international humanitarian response to natural disasters that typically hit Southeast Asia. Currently, national and regional strategies and various disaster response simulation exercises of ASEAN and its dialogue partners focus heavily on natural disasters such as earthquake, volcanic eruption, flooding and typhoon, but not on technological disasters. The 3rd UN World Conference on Disaster Risk Reduction (WCDRR) held in Sendai, Japan in March 2015 cast the spotlight on preparedness for technological disasters with a working session on a range of technological disasters including chemical and nuclear emergencies. Natural disasters can trigger technological disasters (“natech”) and these simultaneous crises may pose tremendous risks to countries and communities that are unprepared for them. The most recent example is the March 2011 Great East Japan Earthquake and Tsunami which triggered a nuclear disaster in Fukushima prefecture and led to the evacuation of more than 120,000 residents. The director-general of Vietnam Atomic Energy Agency recently stated that Vietnam would only begin constructing its first nuclear power plant when all safety conditions are met. Though Vietnam has the most advanced nuclear preparatory programme in the region it is also vulnerable to disasters. Its government’s climate modelling exercises found that due to climate change, the coastal province of Ninh Thuan, where the first nuclear reactor will be built, is now more vulnerable to stronger typhoons which can generate severe storm surges that damage infrastructure, according to government scientists. The Vietnamese coastline is also vulnerable to tsunamis potentially originating from a strong tremor in the South China Sea. 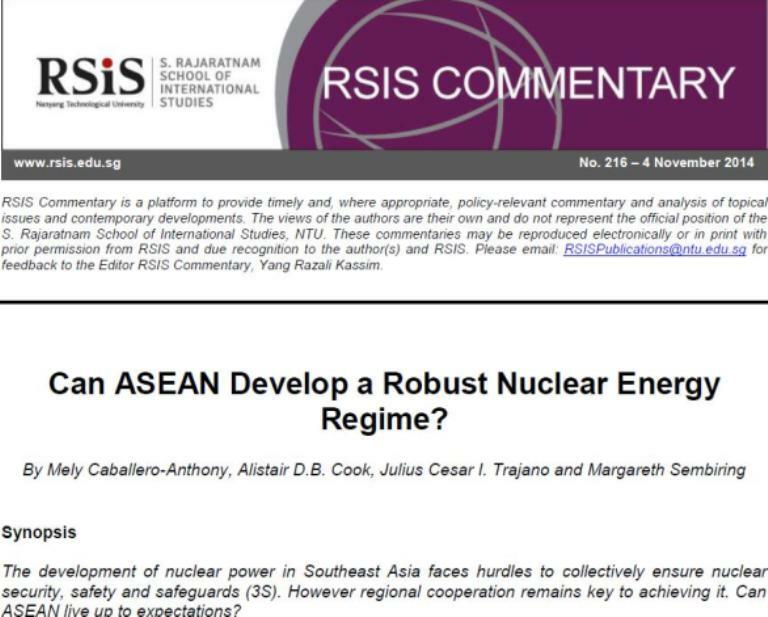 Although not all ASEAN member-states have plans to build nuclear reactors, there are crucial reasons why they all have a vested interest in collectively institutionalising a joint emergency response. The transboundary radioactive plumes from a nuclear meltdown may have severe consequences, such as higher cancer risk and contamination of food and water sources, irrespective of national boundaries in the region. Some ASEAN countries have already been receiving nuclear emergency training from nuclear-powered states through bilateral arrangements. For instance, Russia and Vietnam have just signed an agreement on human resource training, including crisis management; accordingly, Russia’s ROSATOM will train Vietnamese nuclear experts from now to 2020. The US Department of Energy – National Nuclear Security Administration has been assisting Vietnam and the Philippines to establish emergency operations centres and a graphic information system that will facilitate information sharing and conduct annual training on nuclear and radiological emergency response. The Japan Atomic Energy Agency (JAEA) regularly holds training courses on nuclear emergency preparedness and response with the respective nuclear agencies and disaster response units of the governments of the Philippines, Thailand, Vietnam, Malaysia and Indonesia. These bilateral arrangements to enhance the national capability for nuclear emergency response of individual ASEAN states should be replicated and expanded at the regional level as ASEAN member-states can engage nuclear-powered states who are also ASEAN’s dialogue partners. Two mechanisms can be institutionalised to bolster the region’s nuclear emergency response capability, joint nuclear emergency drills and a regional nuclear crisis centre. ASEAN member-states can incorporate joint nuclear emergency drills into the region’s disaster response exercises such as the ASEAN Disaster Emergency Response Simulation Exercises and the ASEAN Defence Ministers Meeting (ADMM)-Plus Humanitarian Assistance and Disaster Response (HADR)/Military Medicine Exercise. In addition, given the trans-boundary implications of a nuclear disaster, relevant countries can work together to formulate joint efforts to clean up affected sites of radioactive deposits. To this end, the region can establish a regional contingent of specially trained nuclear disaster emergency responders, similar to the ASEAN-Emergency Rapid Assessment Team found in the ASEAN Coordinating Centre for Humanitarian Assistance on disaster management (AHA Centre). This cooperation platform can develop a set of standard operating procedures that synchronises the different operating protocols used by each country, which will enable better cooperation and coordination among countries involved in joint nuclear emergency relief efforts. Considering the need to coordinate responses to nuclear crises, ASEAN can set up a regional nuclear crisis centre in which the region’s highly trained radiation emergency responders can come together and participate in workshops, trainings and joint drills. This would facilitate information exchange and increase response coordination in case member states will get affected by radiation plumes. In times of crisis, the centre can act as a special coordinating body for regional and civil-military nuclear emergency response. The peculiar nature of a radiation-related disaster requires the existence of a special coordinating body, such as a nuclear crisis centre, which is expected to be conversant with the appropriate responses to this type of technological disaster. It may also serve as an information clearing house, relaying up to date information regarding radiation risk in the region. It can be a specialised unit within the AHA Centre. However, support from and coordination with all ASEAN countries, militaries, and existing civilian relief organisations is essential if a regional nuclear crisis centre is to be established and recognised as a regional coordinating body. In view of the nuclear energy plans in the region, it is now imperative to start cultivating a regional culture of robust response readiness. To be able to respond to a nuclear crisis in the future, ASEAN member states, with the support of their dialogue partners with greater technical experience in nuclear power, should now enhance regional coordination, communication, and training on technological disasters and a thorough regional emergency preparedness and response plan. Early preparations can help the region identify and address its gaps and limitations in its response readiness even before any of its members builds a nuclear power plant. Julius Cesar I. Trajano is Senior Analyst with the Humanitarian Assistance and Disaster Relief (HADR) Programme, Centre for Non-Traditional Security (NTS) Studies at the S. Rajaratnam School of International Studies (RSIS), Nanyang Technological University, Singapore.